The Parlaytm firmware codebase uses a C++ object oriented, single threaded, event driven architecture. It has a clear and repeated and extensible Active Object design pattern for easy project implementation and maintenance. This single threaded architecture prevents the threading and blocking perils that can cause intermittent instabilities. It also supports full software instrumentation - with external control and visibility throughout. The Parlaytm instrumentation is accomplished by providing message based interface to the functions and variables of the C++ class. A preprocessor identifies those functions and variables that should be accessible, and generates the code to interface. In this manner, the internal member functions and variables can be called, set and streamed. Items - C++ object that can receive messages. The codebase is comprised of items - from controllers to drivers. Messages - a structure of data that is passed between items. Messages are of type order, response, and notification. Messages can be sent to/from remote or internal items. Message Pump - A special singleton item that handles the message queue, and routes the messages to the proper recipient. This item also manages timed events, and routing responses to callback functions. Preprocessor - Scans the codebase to generate the discovery information of commands and properties of Items. Messages provide the intra-communications between items in the system. For example, a controller will send a message to a SPI based sensor driver to read an ADC. When the data is received a response message is sent back to the original caller with the data. 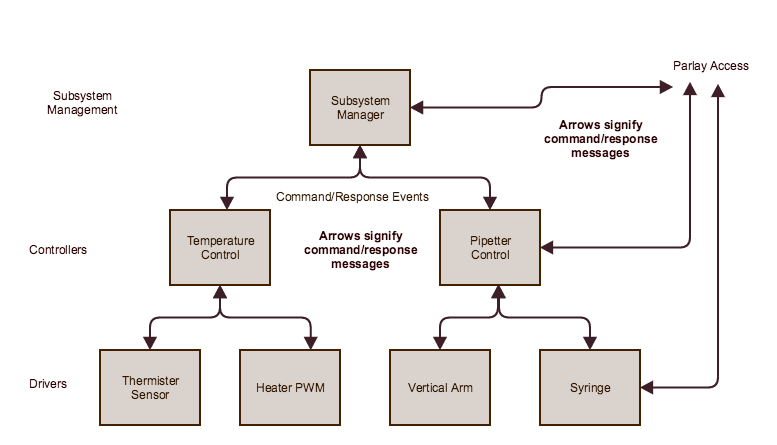 Just as intra-communications uses messages, the same method is used for inter-communications between sub-systems, and the Parlay test tool. The functions and variables of each Item of each subsystem are "discovered", and made accessible as commands and properties respectively. This allows for external control of components, and monitoring of data - i.e. instrumentation. Command messages will result in the item function being called, and upon its completion, a response message is returned. Properties, which are member variables of the item, can be read, set, or streamed (as they get written or at a desired rate) . The Parlaytm UI allow the user to choose the item, and the item's commands or properties to control. 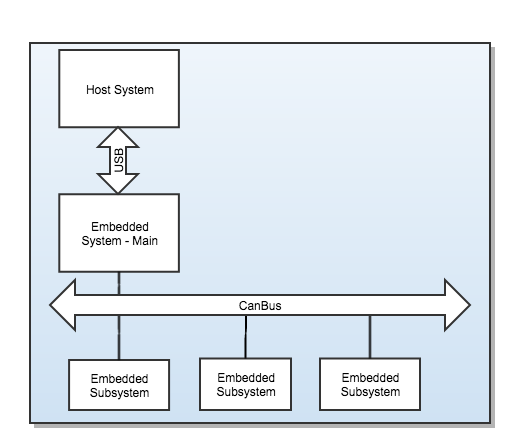 The items in a subsystem are hierarchical - generally each item controls the items of the next level. However from Parlaytm test UI, all items can be accessed. For example, a temperature control item can be started with a chosen target temperature. 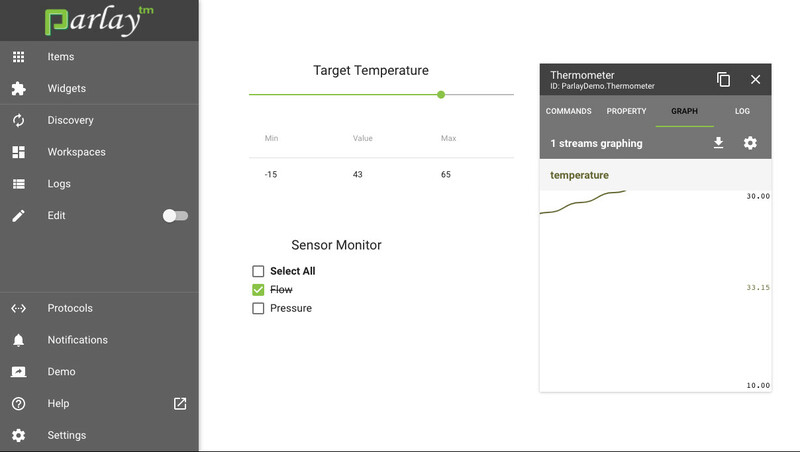 The subsequent thermister sensor response can be streamed and graphed live on the PC. For Bluetooth BLE communications, the BLE characteristics are translated into the message protocol of the firmware, making simple, discoverable controls from a mobile device. No matter the complexity of the system, the commands and properties of all system Items are accessible and controllable from the Parlay UI and scripting.